I have done the chocolate dipped spoons for stirring into coffee and everyone enjoys them. But this year I wanted to create something really fun for the kids to enjoy with their hot cocoa. 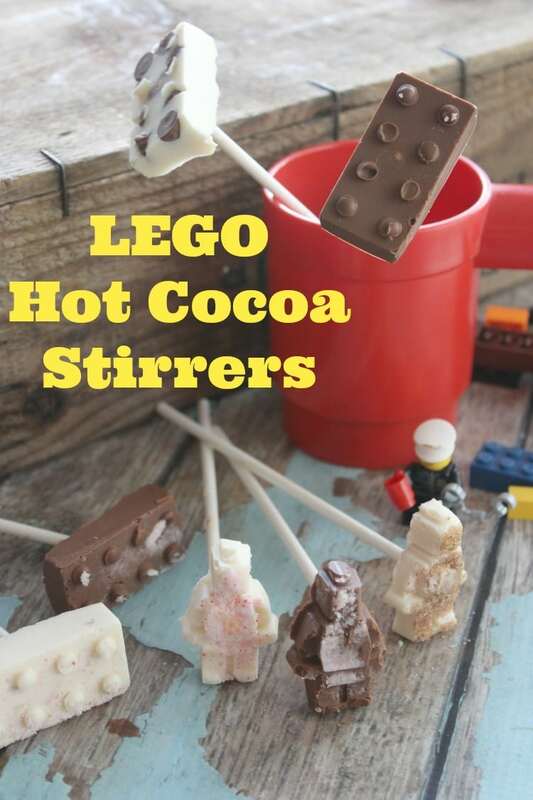 We have these really fun silicone LEGO molds that have gotten a lot of use for making soap, Jello, playdough, ice cubes, and now these yummy Chocolate LEGO Hot Cocoa Stirrers. They can be made in white, milk, or dark chocolate, or even with colored candy wafers. Then you can make them even more delicious by adding different extracts, crushed candies, and other items that melt right away into hot cocoa. -Silicone molds – You can buy the LEGO molds here. -You may also wish to have cinnamon, peppermint, mini marshmallows, mini chocolate chips, and other small dissolvable mini candies for dipping. Step 1: Pulverize candy canes/peppermints in a food processor, coffee grinder, or by hand with a rolling pin if you are going to use them. Step 2: Begin by setting up a double boiler to melt your chocolate, if you don’t already have one. This is just a glass bowl set over a pan of simmering water. Add ½ cup chocolate chips/wafers to bowl and stir frequently until smooth and melted.I recommend working in small batches so your chocolate doesn’t set up before you are ready. Step 3: You can divide some of your melted chocolate at this point and stir in a bit of extract to give it some flavor- peppermint and orange are our favorites. For peppermint flavored stirring sticks add crushed peppermint to the mold first, or you can sprinkle with cinnamon and sugar. Step 4: Carefully spoon melted chocolate into molds. Step 5: Insert sticks into center of mold and prop them up while waiting for it to set with a clothespin. Step 6: Once chocolate has completely hardened you can remove gently from the mold, wrap each LEGO Hot Cocoa stirrer with plastic wrap or place in a container to set out on the kids hot cocoa bar.